Many, many years ago when my desire to create a personal collection of all the Fine Scale Miniatures kits that George Sellios ever made I assembled this "first" collection one kit at a time. I accomplished this task by building ever single kit (some kits several times) for customers accepting un-built kits as payment. Needless, to say, after a while the kit instructions became almost totally unnecessary and strangely enough, I found a market for empty kit boxes & FSM instructions. Fast forward to today and unfortunately, I've not been building the extraordinary FSM kits as much as I would like, but i have found other activities to keep my model building interests alive and well. A few years ago our DEBEN LLC purchased the structure & ancillary equipment portion of Thomas A Yorke Enterprises (2001 & earlier). 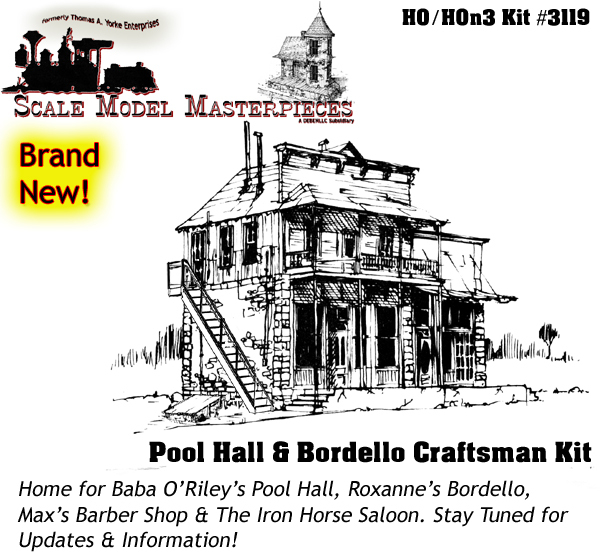 Since the Tom Yorke kit line lacked accessories and the California Freight & Details HO Product line became available in 2012, we added on this Detail Parts line to diversify our Scale Model Masterpieces product line. Although we're no longer in the Out-Of-Production Craftsman Structure Kit market any more, we do have kits available on Consignment. Links to the listings are just below this message. So take a few minutes to browse around and start adding items to your Shopping Cart. You can purchase here with confidence that your information is 100% *secure* and please know that we do not share any of your information with anyone!